Homeschool language arts lesson plans based on literature - an effective use of literature as a base to teach handwriting, spelling, writing techniques, grammar and punctuation. This is done by selecting a model of excellent literature and drawing all the aspects of language arts from this. 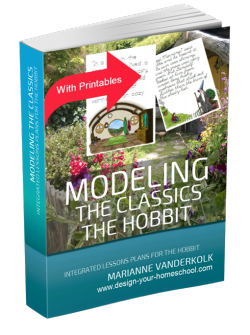 This can be used as a complete homeschool language arts curriculum which you create. In order to write Language Arts lesson plans based on literature, you first need to select the finest literature as a model. An excerpt from a children’s classic book is a wonderful place to begin. 1. What is a Classic? 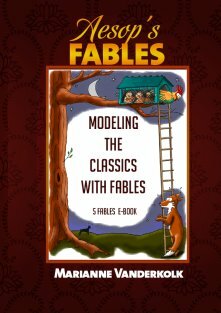 A Classic can be defined as a book which enriches the child’s imagination, stirs the emotions, and places them in another time and place. It is one which lives out the lives, thoughts, motives and dilemmas of interesting characters. It is one which is written beautifully, creating characters of depth, places of wonder, and worlds that are dreamt about. It is a classic when it deserves to read and re-read, and enjoyed each time. they model for us what good writing should look like; they model depth of character; they model exciting plots and they use a range of interesting literary devices. 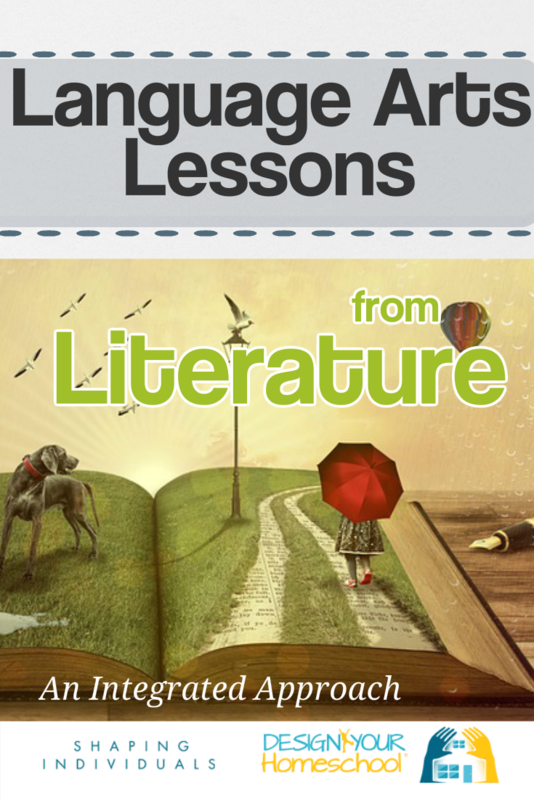 For this reason, the classic books are an excellent starting point for any and every author. In choosing literature to use as a model, I would encourage you not to choose a random excerpt, but rather choose a book as a whole. Read the book aloud, savour and enjoy it. Then, and only then, should you look at the wonderful devices you have found in the book which you love. There's nothing worse than reading one good passage from a book and pulling it apart without knowing it in its entirety. I would hate to ruin excellent literature by doing this and I know that from my own schooling, our English Literature studies was far more about pulling an excerpt apart and critiquing it, without ever enjoying it. Please, take care not to do this! How? Enjoy it first! Read it; have fun with the character voices; live with the characters; laugh and cry with them. Then, challenge your child to look at the writing in "wonder." "How did Mr Tolkien write so well? Let's see how he did it and let's try to copy what he did!" 4. Choose some excellent excerpts from the book. Once you have enjoyed the book, then choose some pieces of literature from it. Choose them for their literary devices (descriptions, poetry, use of dialogue, use of metaphors). Now.... how do you write language arts lesson plans based on these excerpts? I have written them as "Days", but sometimes the work involved in the language arts activities will take longer than a day. I have written them as "Days", but this may be totally irrelevant. The time of each task will vary with different excerpts you choose. Copy the selection carefully. Use cursive or printing. Decorate it if you wish. Choose appropriate spelling words from the copied paragraph or selection. List spelling rules which the words follow. Find other words which also use the same rule. Discuss the grammar of the passage. Use different colours to identify nouns, verbs, adjectives, adverbs and so on. You may also wish to diagram the sentences. Use the copywork from Day One as a dictation exercise. Write an outline of the plot or description. Use only a few keywords to capture what the main points are. Now, build on the keyword outline from Day Five. Add interesting verbs, dual verbs, nouns, pronouns, adjectives, adverbs. Create an interest filled paragraph. You can either choose to stay as close to the original as possible, or choose to make it into your own creative work - using your own characters etc. Review your paragraph from Day Six and focus on improving sentence openers, using prepositional phrases, using adverbial and adjectival clauses, using metaphors and similes. You may add dialogue. Review your work. Does it need refining? Have you chosen words rich with meaning? Does it create a picture in your reader's mind? Check punctuation of sentences? Copy the final paragraph neatly in cursive or printing. Where will you display this? Do you have a special folder or book? Show your final copy. Read it aloud to your family. Publish it. Why not add it to the Homeschool Gallery on my site? We'd love to see your work. 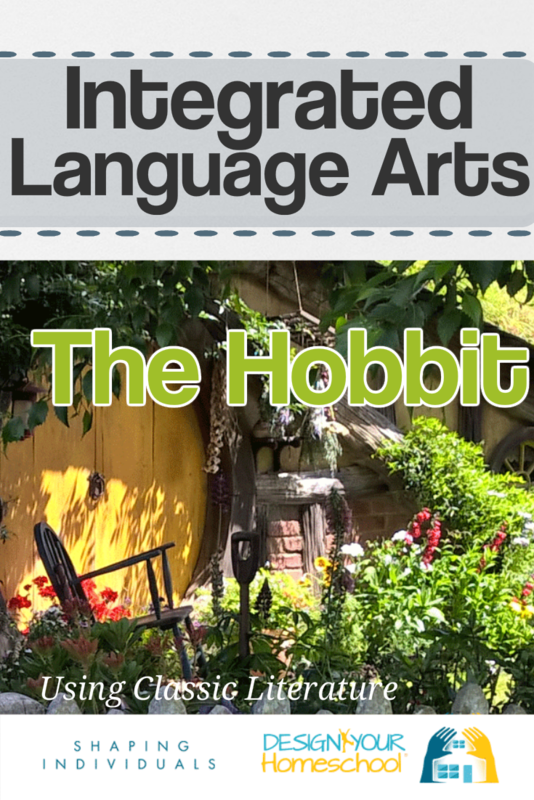 Language Arts Lesson Plans from the Hobbit. You can also see language arts lesson plans I have created using modeling. 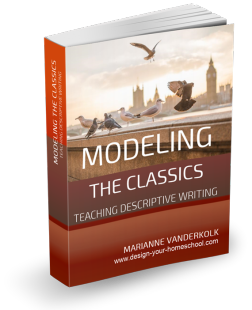 Each lesson plan focuses on a particular stylistic element. These lesson plans are condensed versions of what I have described on this page. They cover some, but not all language arts.